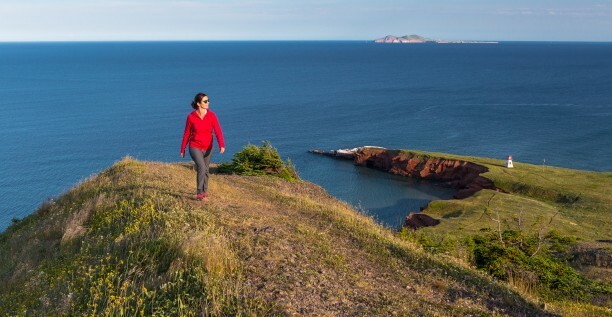 Hiking is one of the most interesting ways to explore Les Îles. It is often still possible, in perfect safety, to take yourself away to the end of some lost road that leads to who knows where (one is never very far away from homes). Local specialists offer a whole range of fascinating guided excursions. More and more services are now offered for hiking and outdoor enthusiasts. See Tourism Operators below. A booklet illustrating hiking trails and circuits going around the islands is now available! Get it now at the Tourist Information Desk for $ 20.00. Grassy hills, forest paths, dunes and beaches that stretch forever. On each island of the archipelago, there are trails available for strolls and walking tours. While it is possible to take long hikes on the trails, the back roads and the endless beaches which also offer great walks and gorgeous panoramas. Walking the islands is like discovering a quiet and charming universe. There are three places worthy of mention, either for their natural habitat or for their typical Madelinot flora and fauna. Two sites are designated as reserves in Les Îles: Brion Island and East Point in Grosse-Île. Rocher aux Oiseaux (Bird Rock) became a bird sanctuary in 1919. "I've walked the full distance between Grosse-Île and Grande-Entrée, along the Pointe-de-L'Est beach. It' a WOW experience! It's a great hike which I will want to do again someday. I left Grosse-Île at 9a.m. and reached Old Harry's at 7p.m. What a wonderful day at the beach!" 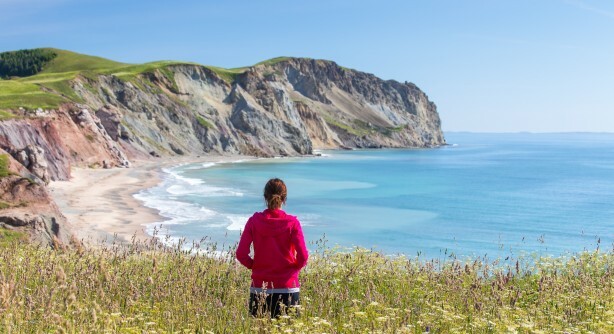 "Hiking along the Magdalen Island coast, photographing the cliffs, inhaling the clear sea air, enjoying kilometer after kilometer of wild ocean beaches and dunes. Perfect!" Never walk near the edges of cliffs and capes as they may be eroded and dangerous. Stay 3 meters away from the edge, particularly where you see this warning sign.